X-Cart reBOOT is a multi-purpose, fully responsive ecommerce template based on the most popular HTML, CSS, and JS framework of them all, Bootstrap. X-Cart reBOOT is available for X-Cart Classic 4.7.x only. Configurable button colours, add to cart, wishlist, minicart etc. 20 types of footer contents available! Lots of options, including effects and animations, stickyness etc. Views can be switched and even sorted by price/stock/name with no page refresh! Optional additional product data including banners, file downloads, FAQs, videos and audio! Seamlessly integrate a Wordpress blog in minutes! Valid RSS feeds for latest products and latest news, generated manually or by using a cron job. Alternative uploads manager for files, images, audio, video etc. Allows you to use mega menus and dropdown / flyout menus at the same time in your header menu. Menus can also be tweaked further. Allows you to specify featured categories, which can be displayed in various styles, on the homepage, or anywhere else. Allows your customers to post testimonials and displays them on a dedicated page with pagination and per page selector. It also includes an easy to use administration section. Allows you to add upselling products in bulk, from a category or a manufacturer. You can choose how many upselling products to display and they can be random or not. The standard upselling products module will still function alongside this addon. Informs you which kind of device your customers ordered with - Mobile, Tablet or Desktop. 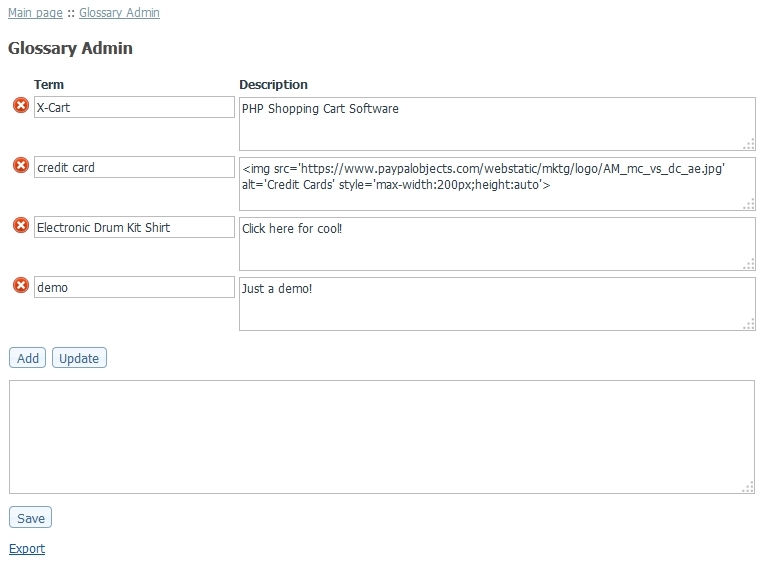 You can also display specific content in the store according to which device type the customer is using. Generate custom forms with ease, with automated email sending. No PHP skills required. Splits manufacturers listing pages into A-Z. Handy if you have hundreds of manufacturers. Simple password protection for static pages of your choice. This displays extra product data on the product pages. Product Banners - up to 3 rotating banners to alert customers of promotions or important information. The data can be made common for multiple products if you wish. Advanced HTML editors with image and file uploaders, CDN support and more. Adds unobtrusive text of your choice to the footer of the homepage, category and manufacturer pages. Optional scrollable content box. Seamlessly integrates Wordpress into the store. These FAQs pertain to reBOOT v4.7.x. Please contact us with any questions. Is this template encoded, or does it require an Ioncube loader? No, it's entirely open source. Can I use it on multiple stores? You can, but as per the template terms & conditions, you must purchase one licence per store. Due to the template being fully open source, no, sorry. Is the reBOOT template available for X-Cart v5.x? reBOOT is available for X-Cart Classic v4.7.x only. v5.x has an entirely different code and template architecture. We have no plans to convert to X-Cart 5.x at this time. X-Cart v4.x Classic is still a very capable platform to base a store on, is easy to modify and will be supported for many years to come. Is the reBOOT template compatible with X module? You can install any third party module with reBOOT, but being a custom template, you may need to adjust the installation. Smarty code that is to be modified or replaced may slightly differ to what is in the third party module installation document. If you are not confident with installing X-Cart modules, you can hire us or other professional to perform the installation for you. Why is my store, or a specific store page blank? In the first instance, check the latest PHP logs in /var/log which should help you track down the issue. You can also audit your Smarty templates by running Tools > Maintenance > "Check the syntax of all templates"
See here for more info about Smarty v3 in X-Cart. Why does my store fail the Google mobile friendliness tool? Ensure reBOOT Settings > Misc > "Allow zoom / pinch on mobile devices" is unchecked. Then try the tool again. How do I upgrade from an earlier version of the template? Move the previous skin/reboot folder to /skin_backup then proceed with the installation as usual. Any previous template modifications / template setting changes will need to be re-applied. Can I upgrade reBOOT and keep my design changes? No, you'll need to re-apply your design changes. We don't provide diff patches for upgrades, but recommend using a file comparison tool, such as Beyond Compare or KDIFF. Which Bootstrap version does reBOOT use? Currently Bootstrap v3.3.7. We will not be upgrading the template to Bootstrap v4. If you need Bootstrap 4, try our Ultra Template. How do I modify the theme? Also see the reBOOT settings > 'Theme' and 'Layout' options. How do I modify the homepage content? In admin, click the 'Welcome Message' link to modify the welcome message HTML. Go to the reBOOT settings > 'Homepage' and enable / disable the features. How do I modify the sidebar content? How do insert a custom menu box to the sidebar? Or, in the reBOOT settings, see Sidebar > 'Enable promotions menu box'. How do I modify the product page templates? The product page has various layout styles, which can be tweaked in the reBOOT settings > 'Product'. How can I rearrange or add content to the product accordions / dialogs / tabs? How can I enable lazy loading on the homepage slider? Edit line 27 of skin/reboot/js/custom/jquery.slick.init.js (change to 'ondemand'). We recommend your slider images filesizes are as small as possible. Use compressed JPEGs, not PNGs. How can I adjust the homepage slider autoplay speed? How can I disable lazy loading completely? Not advisable, as lazy loading speeds up the store, saves bandwidth and server requests! How can I change the menu and dialog box colours? Which templates do I edit for the footer contents? Why does the Wordpress blog appear strange / broken? This may happen after changing settings in Wordpress. Ensure /blog/.htaccess is blank, or set the permissions on that file to not writable (CHMOD 444). How do I setup scheduled cron jobs for news and product RSS feeds? For further information, contact your hosting provider. How can I embed videos / audio? See this demo page for shortcodes. You can easily add product videos / audio with the 'Product Additional Data' addon. How do I make an image responsive? ...to the image will make it stretch 100% of its container width. ...will also center the image. How can I set the default product listings view to a different view? The cookie for the layout is 'products_layout', so delete that cookie also. You can also disable the view switcher buttons in the reBOOT settings > 'Products'. How can I adjust the columns per row in grid view on product listings? How can I change the footer payment logos? How can I restrict content to logged in customers only? Does the template support the Infinite Scroll module? No, we believe infinite scroll is inappropriate for ecommerce stores. Standard pagination is far better for SEO. Info. Does the template support the Refine Filters module? Yes, we have tested and tweaked the Refine Filters module with reBOOT. How do I detect the homepage in Smarty? Why do my RSS feeds not display in my browser? Each browser renders RSS differently. Firefox renders them well. For Chrome, you'll need to install an RSS feed reader. Also, your RSS feed may not be valid, due to invalid HTML code. Click here to validate. How can I hide elements according to screen width? How can I remove the default testimonials? How can I omit out of stock products from the header dynamic search results dropdown? Can the image gallery be customised? How can I get and display random gallery images? Why are my product detailed images thumbnails huge? Go to Admin > Tools > Maintenance and click 'Re-generate the image cache'. Why is the register and/or checkout page cut off? Ensure you have set a 'terms and conditions' page in reBOOT settings > Misc. How can I increase the maximum image/file upload limit? Check / increase the 'post_max_size' and 'upload_max_filesize' limits in your server php.ini file / hosting control panel. Or consult with your hosting provider. Why are the category menus not displaying categories? Ensure Admin > Modules > Flyout Menus > 'Cache the menu' is unchecked. How can I display a dynamic lightbox on a specific product? How do I include Unique Product Identifiers (GTIN/UPC etc.) in the Google Shopping product feed? By adding new product 'extra' fields. See here for details. Why am I getting strange vertical gaps in my template layout? It could be due to 'byte order marks' in some template files. Download this file. Upload utf8_bom_fix.php to your store root, then run in your browser. Delete the file after. When using Clean URLs, clicking on a tab now keeps the URL slug. Improved custom theme options, more control over layout colours, buttons etc. reBOOT is used by hundreds of stores around the World. Below is a user-submitted list of live stores. Under no circumstances place any test orders. The Meteorite Exchange, Inc. Feel free to browse our meteorite store and ask any questions, but please don't place any test orders. Thank you! Super Inks Supplier of printer consumables, with free delivery in the UK. Newcastle Flowers North UK based seller of flowers for all occasions. Saturn Sales & Services Nurse Call Systems, Intercall Nursecall, Dementia, Staff Attack Solutions. U.S. Candle Company Browse our candle shop as much as you like but NO TEST ORDERS please. Feel free to ask us questions if you like. eRCMarket European one stop store dedicated and specialized in Radio Control Helicopters and Drones. The Debug Store UK-based distributor of electronic test equipment and embedded systems development tools. Free UK and EU shipping. WarGameStore UK retailer of Warhammer, Warmachine, Malifaux and Infinity models. Baby Showers By Mail Great gifts for new moms and families. Buy as a gift and baby needs shipped every month just when needed. Liapela Modern Baby Modern Baby Products, Strollers, Car Seats, Cribs, High Chairs, Nursery, Toys. Safemate (UK) Ltd. Safemate is a mobile personal alarm with GPS tracking and GSM. Pantano Power Equipment A US based outdoor power equipment and parts dealer. Nassau Hobby Center A US Based Full Service Hobby Shop Specializong in Trains, RC, Models, Slot Cars & Rockets. Pure Image Signs Signwriting, vehicle graphics and Printing. Modelbouwshopper Marum Specialists in Radio Controlled Cars, Helicopter, Airplane/Glider, Boats and Drones. Trendy Kid Kids luggage for kids to tweens - Travel Buddies and Travel Kool luggage. All Around Consignments New and pre-owned clothing, accessories, home goods, furniture, sporting good, tools and more. Cape Cod Weather Vane Company Hand Crafted Copper Weathervanes & More. KJ Beauty Store A US based retailer of all Hair & Beauty products. Please No Test Orders! Thanks. World of Omega Premier US Based Retailer of top name brand vitamins, supplements and Omega Oils. George Perry Ltd. The UK's oldest supplier of Fresh Fruit and Vegetables. Magic World Learn Magic Tricks from the UKs No.1 Magic Shop based in Manchester. We sell playing cards, card tricks, mindreading, mentalism, and magic sets. Shoes2u Australian online shoe retailer. Designs By Seed Unique gift ideas, homewares, wedding gifts, jewellery and contemporary art from UK designers and craftsmen. Based in Frome, Somerset. Tea With Grace China, tea, linens, bakeware, and ideas to help you host a lovely tea. iSexy Redpoints Gift Mall A Worldwide Rewards Program For Everyone & Every Business! How Do You Collect iSexy Redpoints? What Free Gift Will You Receive? Bali Homewares Hand selected Balinese Homewares direct from Bali to your door. For a free link to your reBOOT based store, click here. Promote or recommend the X-Cart reBOOT 'unlimited domain' licence and you can earn up to 25% of each sale at $399. Only a Gumroad account is required. Simply contact us with your Gumroad account email address. We'll send you a unique link to share with your audience. You'll then earn a commission on each sale you refer. As long as a customer purchases within 30 days of visiting your link, you will get credit for the sale. Payments are deposited to your Gumroad account and paid out every other Friday. © 2001-2019 xcartmods.co.uk. X-Cart and the X-Cart logo is a registered trademark of Qualiteam Software.